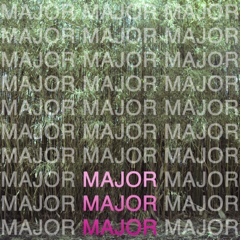 The experimental Austin based duo Major Major Major combine noisy art-rock with highly-melodic doo wop-inspired garage pop on their excellent self-titled debut EP that was released earlier this year as a free download on their Bandcamp page and is also available on a shiny slab of 12” vinyl for the super-cheap price of $5! The 5 song debut was recorded with Barrett Walton, who has also worked with Woven Bones and Yellow Fever, to name a few. “We All Come From You” with its ambient washes of distortion and choir-like psych-pop vocal harmonies that reach for the rafters, opens the EP on the right foot. “Peace Love Darkness” stands out with a rollicking drumbeat and an exuberant sing-along chorus and the tropical rhythm, fuzzed out guitars and unhinged solo of the aptly-titled "In The Carribean" stands out as well.